Discussion in 'Introductions' started by MommaIvy, Aug 19, 2018. 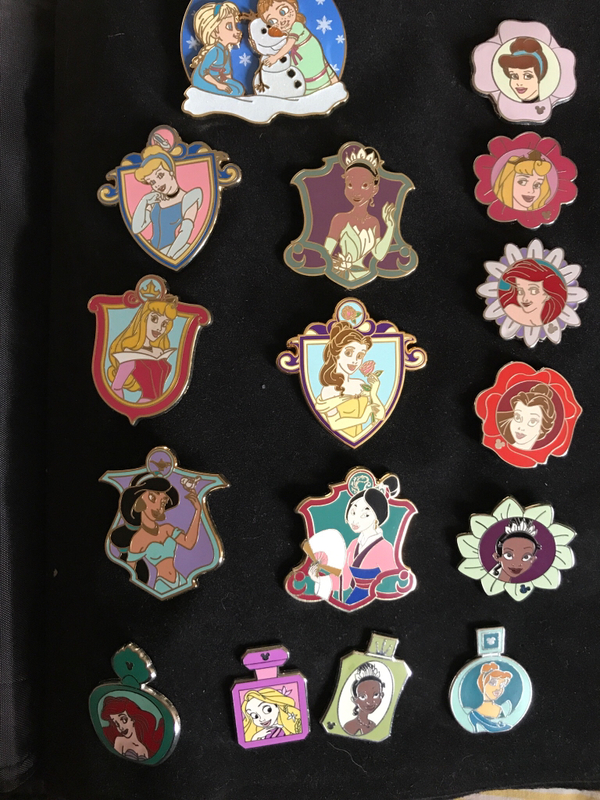 Hi all I’m pretty new to pin collecting. Got started on our first family trip to WDW in 2012, but this year I found out the Disney store has a pin set every month and now I’m hooked!!! Looking forward to building up a collection. So far my purchases have been random but I see here people tend to stick to themes. Guess if I was to focus it would be on the princesses, Stitch, and Orange Bird. Here’s my princess collection. watzshakinbacon, Disneychildwithin, coblj003 and 1 other person like this. Welcome to the forum, what a wonderful collection! Thank you!!! I got a lot of the smaller ones from cast members. Now IDK if they’re real or the scrap ones so I’d never trade them, but I still like them because they were fun to collect. Welcome! Those are some great pins! Welcome to the pin Trading family. I am from Illinois, near Chicago, and there is a small group that gets together every month to trade pins. If you are nearby and want more info please let me know. Hiddenmickey2018 and MommaIvy like this. Hi there fellow Illinoisian and welcome to the forum. Aloha and Welcome! I think sticking to a character/theme (or maybe a few, depending upon the chosen character/theme) is a very wise decision and I would recommend it highly. The rationale behind this is to have a defined collection so as to avoid the temptation of buying every single shiny piece of metal with a pointy back attached. If you like, post detailed pictures of the pins you are questioning in the Pin Comparison section of the forum (found here: Pin Comparison). I'm fairly certain that someone should be able to let you know what you have - and if they turn out (shall we say?) dodgy, you still can use them as push pins for a cork board, turn them into magnets for your fridge, or any number of creative endeavors. Welcome to the forum, like stated knowing what you are looking for helps a lot. I have also found setting a price limit for most pins and special consideration for those special pins. Do your research if you buy from other sources than here or Disney. Lastly enjoy yourself, you picked a great hobby and joined a great forum. Welcome!! And hi!! I love your collection!! Lol I was just about mention the near Chicago trading group. Nice group of people. Went to my first meeting last month. I'm also near Chicago - far western suburbs. I would like information about the monthly trading group. Welcome to the forum from a fellow Illinoisan! Which is just off 355 at the north edge of downers grove near frys electronics. Remaining meetings for the year. Which suburb are you in? I'm from Hanover Park. We get on the Elgin-Ohare tollway and then 355, and we get to Fuddruckers in 20-30 mins. If you are farther west and south 88 would be better. We will be there Sept 15th with all our goodies from the pin event. Which suburb are you in? I'm from Hanover Park. I'm from Roselle originally! Small world. Howdy neighbor! I too am from Illinois, welcome to the fun! I'm from Geneva. Thanks for the info - I'm going to try to make it. I’m way up north in Fox Lake. Fox Lake is a bit farther away, but we do have people who regularly come from Wisconsin. We also have members from Peoria and even some from Indiana. They don't always come every month, but make it a couple times a year. Darling collection. Welcome to the forum. Hello and welcome! Idk if anyone has mentioned this yet, but the monthly releases will end in Dec? They might come out with a new set next year.